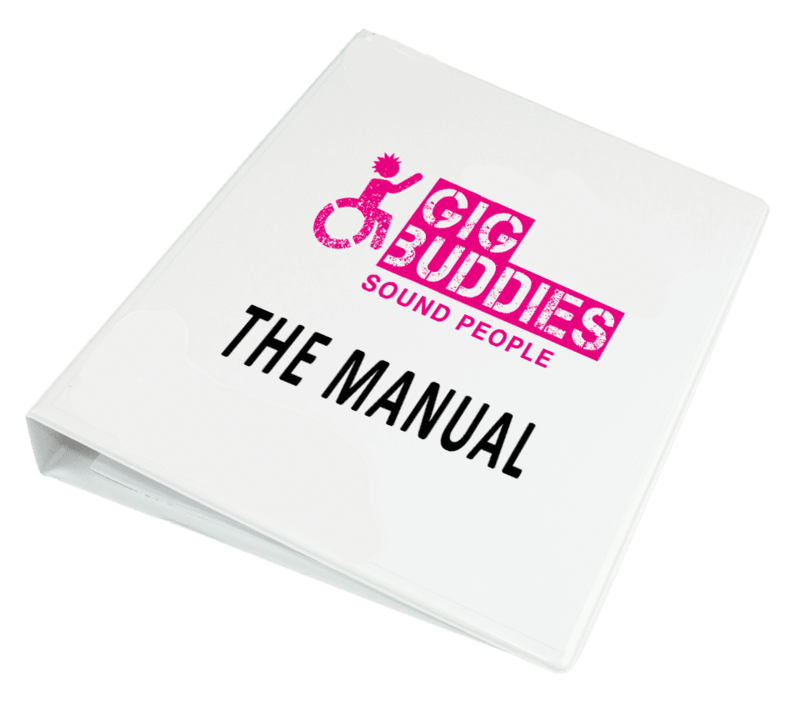 Gig Buddies matches up people with learning disabilities and/or autism with a volunteer who shares the same interests and passions, the idea being that it supports people to grow their informal support networks and friendship circles thereby promoting positive physical and mental well-being. The idea is pretty simple but there’s a lot of thought and work that’s gone in to making sure it’s run as well as possible and that people are kept as safe as is possible whilst also enjoying the richness of activities going on in their local communities. We started off with an idea but through working with our advisory group (The Storm and Thunder Team) and listening to participants and volunteers the project has evolved over time. We aim to keep the concepts of co-production through all our work. 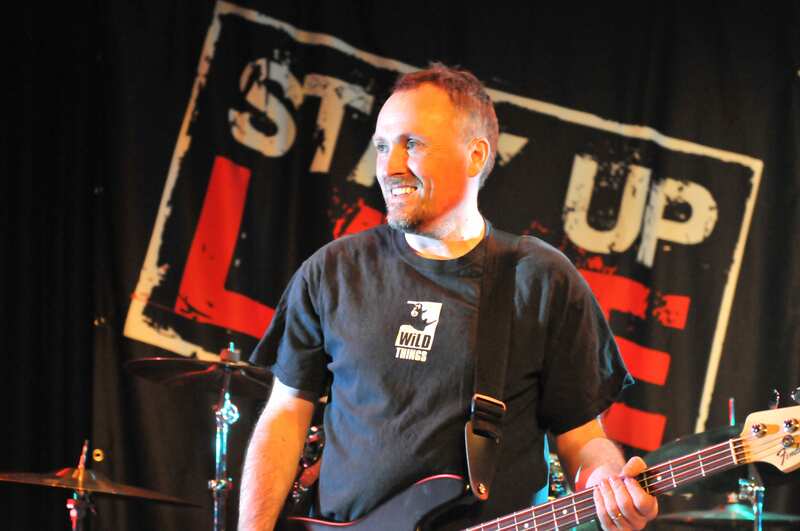 It’s about going to ‘mainstream’ events and gigs in your community that are open to all. In this it’s also essential that it’s about respecting people’s choices. It’s not about us organising our own events, except for the occasional fundraiser and awareness raiser. A gig could be a rock concert but could also be an afternoon of looking round art galleries. The important thing is that it’s your ‘gig’ – whatever it is that you enjoy doing. Other buddies go to football matches, checking out cake cafes in Brighton’s Lanes, nature walks as well as a whole shed load of gigs and concerts. We are passionate about reducing social isolation and whilst we know loads of great support workers the fact is that they are still being paid to do a job. 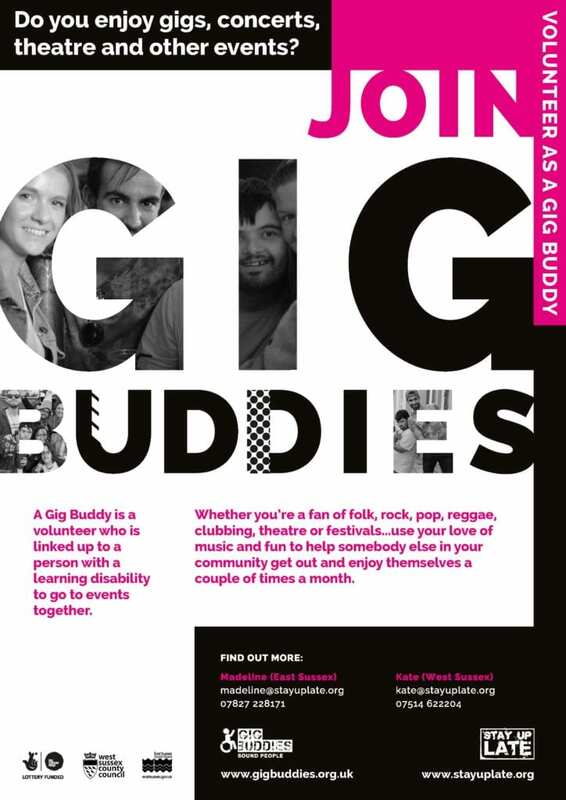 Gig Buddies is all about having people in your life who aren’t paid to be there. We also know that it will look different in every area as everywhere is different. But these 4 things just can’t change. The first thing in ‘The Box’ is the manual which contains loads and loads of know-how that we’ve developed in running the project. Blogs – for example we’ll soon be sharing a case study for how we’re mounting an assault on the Sussex town of Bognor! You’re also part of a sharing community of partner organisations who want to collaborate for good, through this we’ll all be able to learn and develop our projects, and support each other. Unfortunately due to the fact that this website is going to be full of our intellectual property, and trader secrets, we’re only going to be able to let paid up partners access it. But if you click on the image below you’ll be able to have a tantalising glimpse of what’s on offer! Photo profiles so we don’t forget what people look like! It may sound a bit geeky but we really are super excited about this part of the project as it will be a leap forward for us in terms of managing our community better. 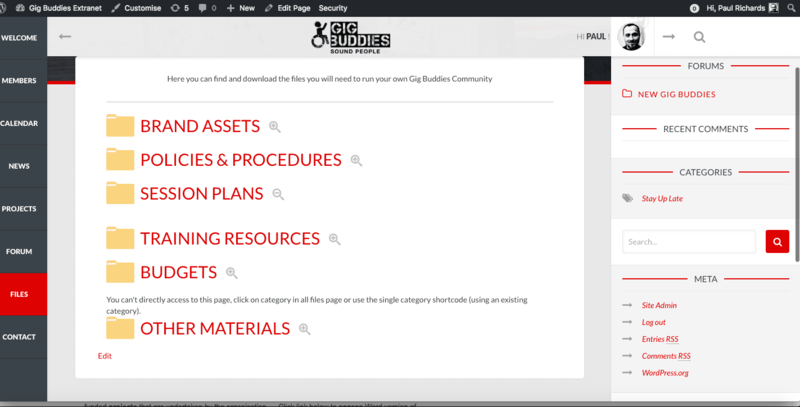 Gig Buddies is a Trademarked thing and so we will help you to find a domain that works for your area. The website itself can be branded for your own colours, have your organisation’s logos added and other things to link it to your area/organisation. Click on the image below to have a look at our Gig Buddies site. We can’t write bids for you (as much as we love writing funding applications!) but we also can’t claim to be experts and simply also just don’t have the time as we’re busy writing our own and working with our existing funders. BUT we can share things to help you. I’ve also created a monster spreadsheet which links to loads of our funding applications with different word counts. I have no idea how I could share that but at some stage I’m planning to create a database to share with partners. In-keeping with our Punk/DIY ethic we enjoy creating our own materials to try and help explain the project further and we’ll be adding these as and when we create them. And then there’s us! We’re more than happy to help give advice and share ideas. 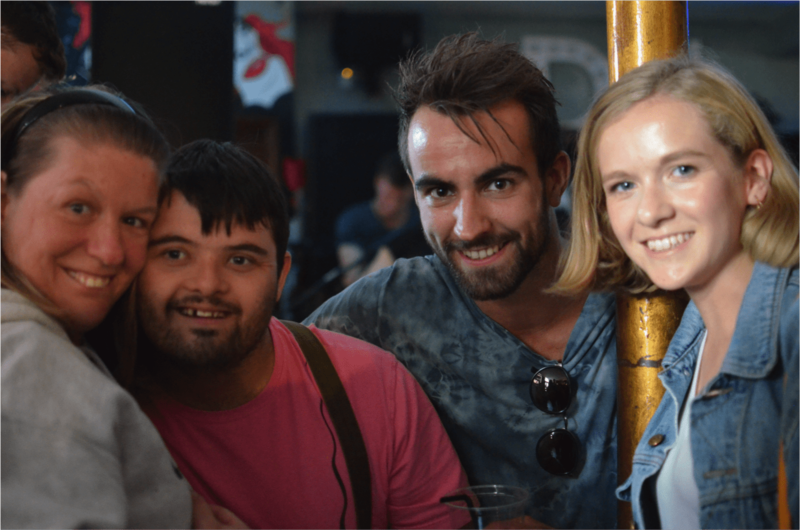 We’ve got loads of experience amongst us of not only running Gig Buddies but also in campaigning, co-production, user-led approaches and how to start a party! But there’s also of course YOU the community of Gig Buddies partners. It’s possibly a controversial view of mine that many of you will no doubt disagree with but I see it like The Beatles. They were always far greater than the sum of their parts and didn’t release anything like near as brilliant as individuals as what they did when they were the fab four. I see it the same way with building a community of Gig Buddies partners. The vision is that we’ll all share and develop our work together the overall aim in mind of improving the lives of people with learning disabilities and/or autism. Do get in touch if you’d like to develop Gig Buddies in your area. While we may sometimes give the impression that we work off the back of old envelopes and cigarette packets, in fact it’s all pretty well thought out and evolving in an organically co-produced way. We’d love you to be part of that.